How to set pre-acceleration to prevent severe press damage? 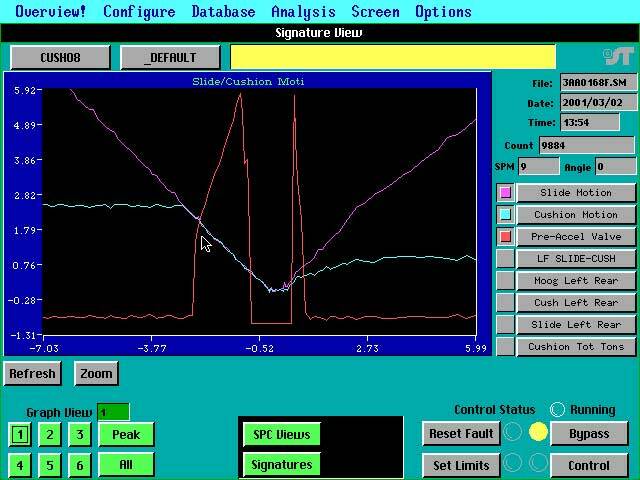 Using the Signature Technologies signatureACE® Statistical Process Controller® and SAMview™ software one is able to get detailed real-time images of press force interactions between components such as accelerating cushions and slide motion. Using these capabilities the operator is able to see the process and properly make adjustments for correct interaction thereby eliminating expensive press damage and lost production. Slide force on each corner. Slide motion - in inches from bottom. Cushion motion - in the same units. 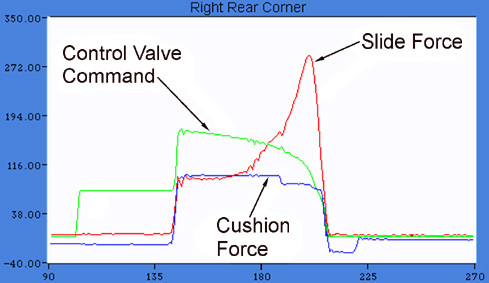 Command - to the cushion control valves. Timing - of cushion pre-accelerate command. The valve signal monitoring feature gives the machine repair a quick way to diagnose and localize component failure in case of system malfunction. The slide/cushion motion screen capture is shown to the right. 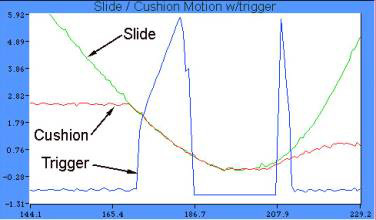 Note the clear indication of the late timing of the pre-accelerate trigger in relation to the closure point of the Slide and cushion. The captured screen to the right illustrates the graphs of the monitored signals from one press corner. Note the concurrence between the cushion force, and the slide force at the beginning of the cycle. The SAM™ module can handle measurement inputs in groups of 8 up to 56 total points. This system is provided installed and can be packaged to meet the customers needs although usually we provide it packaged with a /PPB and install the terminations using /TEB inside the press control enclosure.